DONOVAN has been one of the most beloved artists of the rock era. This special, 2-disc collection brings together for the first time many of his biggest hits on Hickory and Epic records. STORYTELLER features the mega-hits "CATCH THE WIND", "COLOURS", "UNIVERSAL SOLDIER", "SUNSHINE SUPERMAN", "MELLOW YELLOW", "HURDY GURDY MAN", and more, all in the ORIGINAL hit versions - plus a few surprises. Mastered by Steve Hoffman and Kevin Gray from the original mono and stereo master mixes, this collection shows off the great fidelity of the original recordings. The second disc was mastered at 45 RPM and features Donovan's four biggest Epic recordings, revealed in their full sonic glory. All songs on this LP set are full-length versions; as a special bonus, "Colours" is featured in both its album and 45-hit versions. 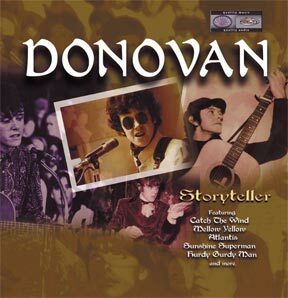 This album will be a must for those who love Donovan and the music of the 1960's.